Hey guys, I've got a little bit of a situation. About a month ago, I clay-bar'ed and waxed my car, using Meguiar's products. I was very impressed with the results. A month down the track, although the wax is holding up very nicely, the weather is improving which revealed my car to be a myriad of swirls. Just about every portion of the body is covered in swirls and random scratches from regular use as well as some scuffing from using a car cover. What I'm asking, then, is what should I do to remove these swirls and scratches/scuffs? I was thinking of using Meguiar's Ultimate Compound to clean up the swirls, scratches and scuffs all at once with a single product, but I've read several threads that go against using the Ultimate compound first. I'm relatively new to car detailing, and my clay bar and wax job last month was my first time doing some form of detailing. Also, if I may add, my car is black. The paint is also 12 years old but holding up strong, albeit swirls and scratches. Would it be a better option to use Meguiar's ScratchX 2.0? The description says that it removes scratches and swirls, so would it be better for me to achieve the results I want with this less-aggressive product? If it also helps, I plan to do this job by hand, since I can't readily find a place that sells a buffer. I plan on buying one of these products tomorrow from my local automotive store, for which these two happen to be the only ones available. Also, would I need to clay bar my car again to prep the surface for swirl and scratch removal? Would I need to wash the car first before undertaking this? If I may ask one more question, I've got this hideous spill on the hood of my car. I can't think of anything to remove it. Would Ultimate Compound or ScratchX 2.0 help remove, or at least lessen the effect of this spill? Can anyone identify what it is? I've asked around and everyone's at a complete loss as to what it is that caused it. It kind of looks like the paint has cracked as a result - it looks very nasty. Although, it doesn't feel any different to any other surfaces on the car, it's just a visual thing. I apologise for the awful picture, but I had to put a cloth over the area and take a picture at the same time in order for my camera to capture it. Hopefully I'm not asking too much, but I'm heading out tomorrow to buy one of these products and am lost as to which one to buy. Thanks for anything you guys can give me! I've been approached with some interesting projects as of late. A customer came to me with a 2008 Mercedes S550 (white) with an overspray problem - it was parked in a body shop - happened to be next to someone who was spraying a car outside the paint booth - caused tremendous overspray all over the S-class. Not obvious, until you touched it, and looked through the windows. I clay-barred the entire car - including the windows. Followed the clay-barring with # 85 on the hood and trunk - first with the red aggressive soft-buff pad, then followed by the yellow pad (they had significant scratches as well) and completed with # 80, then sealed with #21. The car came out silky-smooth, and a shine that was blinding. Customer was extremely happy all-way-'round. Meguiars products are incredible. I put them up against the "Mother's Lovers" all the time - and they eventually switch! Happy detailing! Hope all is well with you. You can look at a milder product like SwirlX for instance, but sounds like you will probably end up with Ult. Compound. ScratchX and UC are fairly similar. You'll want a clean surface, so at least washing. You would only need to clay if the surface feels rough after washing. If it doesnt need clayed, then it doesnt need it. Hey Murr, thanks for the reply. I can't actually try SwirlX since it's not for sale locally (I haven't looked properly but) Would a microfiber cloth do the job? I'm not 100% if the store stocks Meguiars foam applicators. If ScratchX 2.0 and Ultimate Compound are fairly similar, would be better to get ScratchX 2.0 instead? It's $10 cheaper than Ultimate Compound. But I guess I should go for Ultimate Compound, as this spill on my hood is absolutely hideous and you can spot it from a mile away on a sunny day. I just don't want to potentially ruin my paintjob by using something so aggressive and abrasive as Ultimate Compound, as I still have much to learn in detailing. I'm not sure what to do, what do you suggest? Ehh... it can be tried if needed... but you start to risk the fabric leaving its own marks behind. A small test spot can be tried if needed. Definitely fold it over some so you dont get pressure points. Its not as if another brand couldnt be used if you can find something. If ScratchX 2.0 and Ultimate Compound are fairly similar, would be better to get ScratchX 2.0 instead? It's $10 cheaper than Ultimate Compound. Its up to you. You can adjust the strength of the UC (and ScratchX 2.0) by changing how much pressure, speed, passion, etc you apply them with. So even if you go with the stronger product, you can start off applying more gently, and work up. But I guess I should go for Ultimate Compound, as this spill on my hood is absolutely hideous and you can spot it from a mile away on a sunny day. I just don't want to potentially ruin my paintjob by using something so aggressive and abrasive as Ultimate Compound, as I still have much to learn in detailing. I'm not sure what to do, what do you suggest? Sorry, I was typing very late into the night and didn't notice. Thanks again for your insight, I've put off buying a product, as I'm still not 100% sure on which product would best suit my car's paint. The swirls are awful and scratches and scuffs are everywhere. I'm just worried if Ultimate Compound is too aggressive for my application? Unfortunately you'll never know till you try. I'd get both UC and ScratchX, but if you have to pick one, just go the UC. You're working by hand after all, so the extra cutting ability is probably needed..
Hey guys, so I had a go at Ultimate Compound today. I only got the front end done, and it was pretty tiring work. Despite this, I didn't see the results I was expecting. Now, before I place the blame on the product, I am new to detailing so I'm fairly sure the problem was my technique. I parked the car in the sun afterwards, and I did notice a slight decrease in swirls and scratches, however the hood was still littered with swirls even after using UC. Likewise, there was a slight increase in the clarity of the paint, but nothing on the scale of some videos I've seen which show really distinct results even from a distance. The way I approached using UC was to use tape and divide each panel into many small sections, and work on each one by one. I took a small amount of UC and applied it to a Meguiars foam applicator (they did stock them at the store after all) and rubbed in a circular pattern with all fingers gripping the applicator evenly to distribute the force evenly. I did this until the color of the UC turned transparent, then used a microfiber cloth to clean the excess. 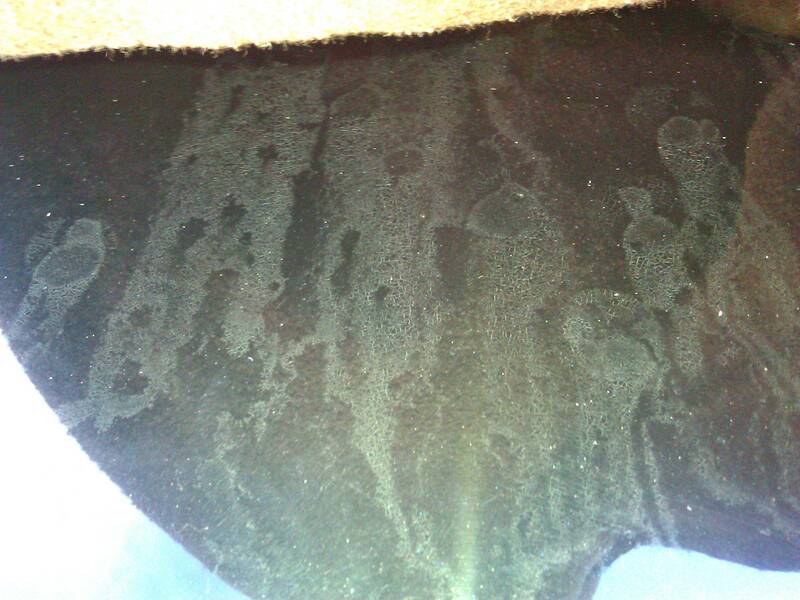 The, I took a second microfiber cloth to clean up the remaining dust and to dry the surface. For each section, I rubbed for around a minute or until it turned transparent. I guess what I'm asking now, is that is this technique adequate or am I doing anything incorrectly? Does anyone have any tips or suggestions for improvement that I could use to get better results? I'd really like to get rid of these swirls and scratches but it's not happening. I don't think I'd want to go buy ScratchX 2.0 as I've already bought Ultimate Compound and it was a little pricey. Your technique sounds about right, but how much "passion" or pressure were you using while applying the UC? You need to use a fair bit of pressure to remove defects by hand but not too much so as to create more swirls/marring. Anyway, two things could be happening here. Either your paint is quite delicate and UC is too agressive for it and so it's creating more swirls; OR your paint is hard and/or the swirls/scratches are deep so the combination of UC by hand is not aggressive enough. Do you think the swirls you're still seeing on the front end are new swirls, or the same ones? Unfortunately, I think you might have to invest in a less aggressive product like SwirlX (ScratchX is too close to UC IMO). Try that on the section you've already worked with UC and see if that cleans it up. If so, try it on an unworked section (test spot) and see if it is strong enough to correct the defects on its own. Where abouts in Aus are you? Hey Davey, I guess I started off a bit more aggressive then applied less pressure as I wore myself out. I didn't apply as much pressure as to leave black spots (the colour of my car) on the applicator, so would that be an indication as to the amount of strength I was using? The scratches are quite light, very light if I'm honest, in that you only notice they exist once you take a real close look. From afar, it looks fine. They're more like surface scuffs that have accumulated from random things and from contact with us opening the doors and so on. They don't feel rough or anything - it's just aesthetic. I'm somewhat sure the remaining swirls are from previous swirls, since I did a section at a time and didn't notice much. I was able to reduce the amount of swirls but not by a whole lot. The effect was more noticeable on the fenders, but on the hood it was hopeless - the swirls still stuck out like a sore thumb. I did notice that on the hood it reduced more scratches than swirls, but even the scratches were a plenty after applying UC. Not too sure which stores stock SwirlX. Does Autobarn and Repco have them? I'm from Victoria. Swirl Removal not working! Advice?